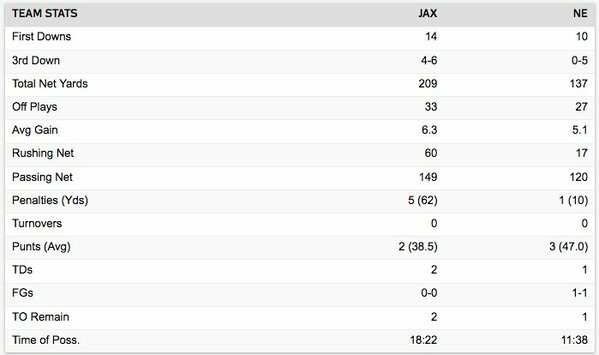 So, yes, Jacksonville's pass defense is good. The Jaguars held opposing teams to a 68.5 passer rating this year, the lowest mark against any defense since 2013. Sack for Adam Butler. Unclear if Jalen Ramsey knows his name yet. Gronk straight to the locker room. Patriots down to one tight end, Dwyane Allen. White's 1-yard run pulls #Patriots within 14-10. 55 seconds left in first half. Where are all those folks who were hating on Brandin Cooks last week? He has four catches for 64 yards on four targets and drew a 32-yard pass interference penalty that set up the Patriots' only TD thus far. Patriots' biggest comeback win this year erased a 14-point deficit (24-17 win vs Jets on 10/15). Jacksonville hasn't lost a game this year that they led by more than 7 points. Gronk hasn't come out of the locker room. Rest of the team has. Gronk is questionable to return with a head injury. @Jaguars left tackle Cam Robinson has a shoulder injury and is QUESTIONABLE to return. Josh Wells in at LT. Right now, Bortles has a 131.4 passer rating today. Only QB with a higher rating vs the Patriots this year was Alex Smith in Week 1 (148.6). Lambo 54 FG is .... good. Crushed it. Going with the wind. Jaguars take a 17-10 lead with 10:23 left 3Q. Great move by Trey Flowers with the deflection. He's been really solid all year. The Patriots converted a third down. Terrible drop by Cooks. Matched up on a LB. Right off his hands. Oof. Incompletion to Cooks killed that drive. Can't have that when you don't have Gronk.